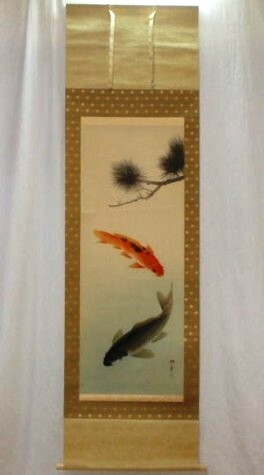 SOLD Antique Kakejiku Scroll w/Box, Carp Koi Pine Artist's Chop. 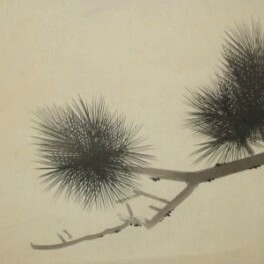 invisibility as it moves from the bottom to the area with the pine branch. 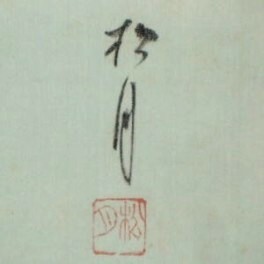 Comments: Beautiful, much sought after scroll with a signed box. 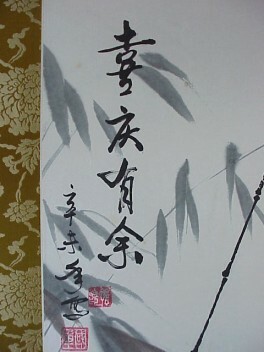 The artist's name is Syougetsu but the year he painted it is unknown. 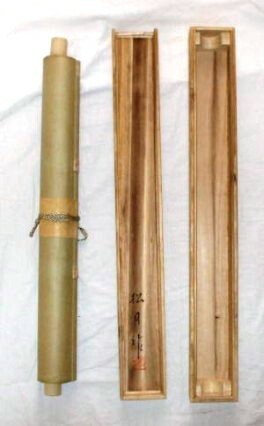 The roller ends are water buffalo's horn. The box has some vague discoloration and part of the top of one end is broken, but nothing that inhibits structural integrity. 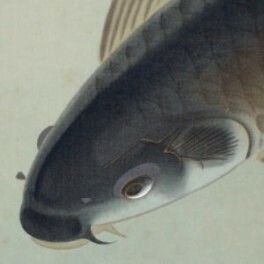 There are small donuki near the fish but in my opinion they are insignificant. 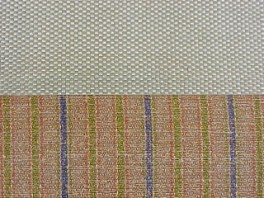 Color: Light brown and light gold behind painting. 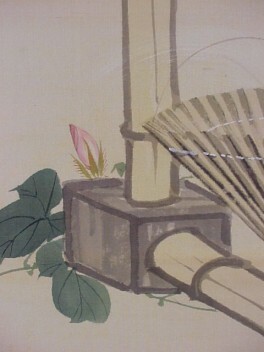 SOLD Antique Japanese Scroll w/ Signed Box, Leaping Carp, Maple Tree. 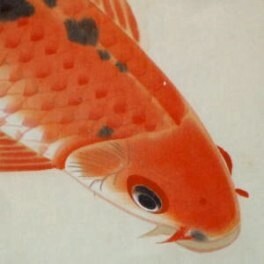 Kakejiku. 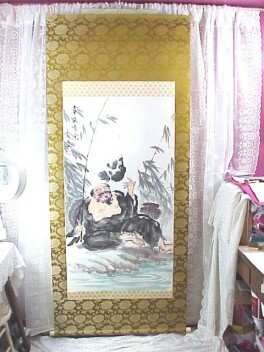 Antique Japanese Scroll, Monk & Tigers. 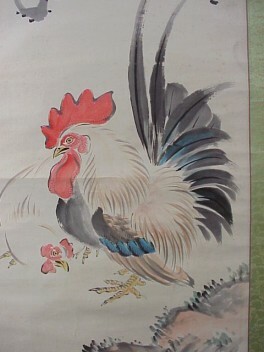 Vintage Scroll, Rooster & Tree. 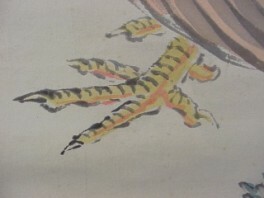 This is something fantastically hard to find; a scroll of a rooster! As you can see from the pictures, there is some wrinkling to the paper, which may or may not come out with careful pressing from the back; your choice if that sort of thing bothers you. 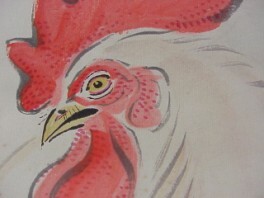 The colors are perfect, and the rooster seems ready to come to life and chase you around the dooryard. Aside from the wrinkles, there is no actual damage, and this is extremely displayable. It measures 18" x 78", and it is $125.00. 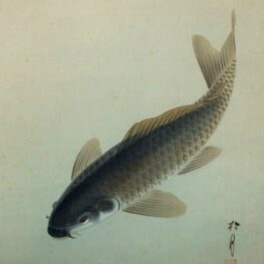 SOLD Scroll of Ebisu at River Side. 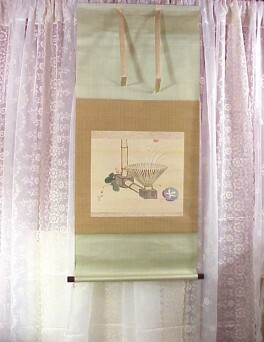 Vintage Scroll; Tea Ceremony ? This one kind of has me stumped. 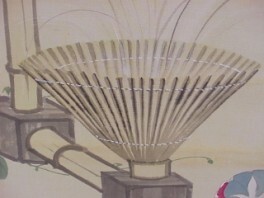 It looks as though it could be a tea ceremony scroll, but I am not sure. 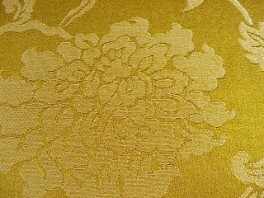 In any event, it is a nice one in very good condition, measuring 48 1/2" x 21 1/2". 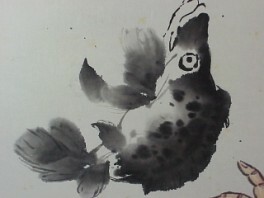 It is sumi and watercolor, and it is $75.00. 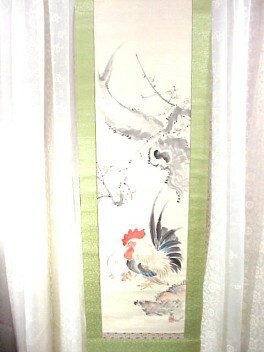 SOLD Vintage Scroll, Tortoise & Crane, Rising Sun. This is a real beauty. I am told that the reason that the tortoise is always depicted with the long tail is that since the tortoise lives for such a long time, and moves so slowly, that moss grows from the back of his shell! 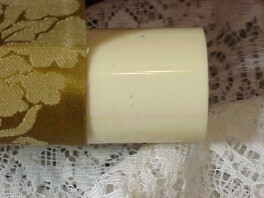 I have moved the top right ribbon slightly to the right to show the small hole that is in the mounting on this one. When the ribbon is allowed to hang normally, this hole is completely hidden. 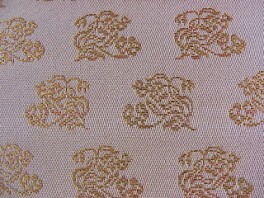 I love the colors on this scroll, and as for the pine tree, tortoise, the rising sun and the crane, my supplier says "Auspicious patterns are collected. 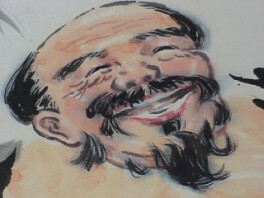 It is good for wishing a long life." 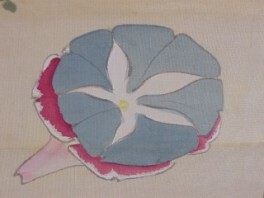 It is hand painted and mounted on silk, painted approximately 1940. A real treasure for only $75.00. This one reminds me of the old black and white photo poster from the '60's over here that showed the old man with the cane going down a dirt road with the caption beneath "Keep on Truckin". 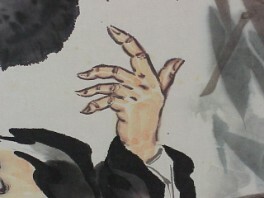 This one is hand watercolor on paper, around 1960, and is in wonderful condition. 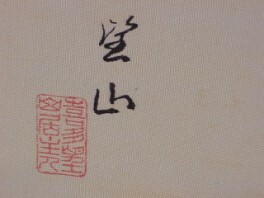 I was able to acquire a translation of this kanji, and it says "Leisure time causes high ideals." It is $75.00. 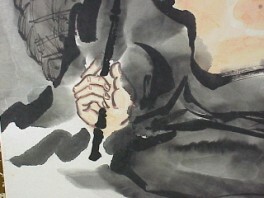 Vintage Scroll, Sumi & Watercolor. 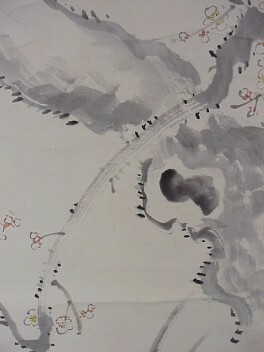 I like this scroll very much for its minimalist depictions. 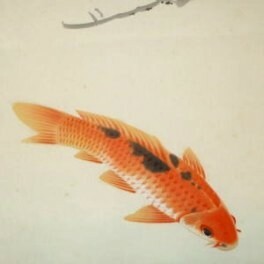 We have koi in a square pond, and a vase above with orchids. 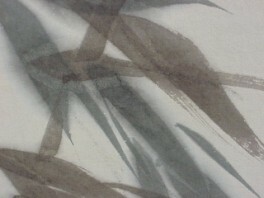 Hand painted on silk, late Taisho or early Showa, it is a rare bargain at only $60.00!